Beautiful blue turquoise is the name of the game here. I love the contrast between the dull finish of the center lava focal bead with the sparkle of the faceted coins and faceted round glass crystals. 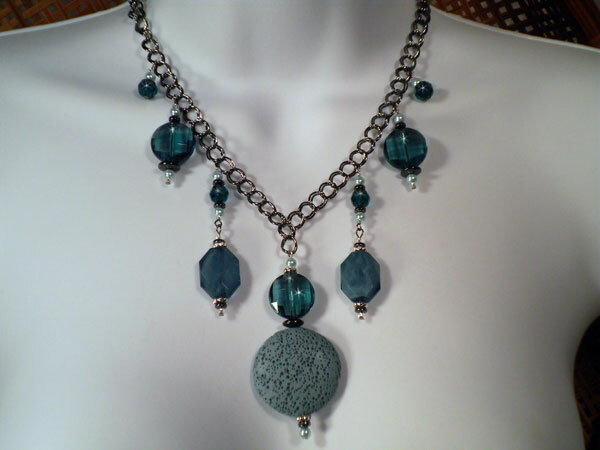 This piece is a lovely mix of many shades of blue turquoise along with the charcoal grey of the chain and the hemalyke saucer beads and the silver of the spacers and seed beads. It measures 22" clasp to clasp with the center dangle adding another 3 inches. The chain is double-linked for added movement and shine and the small light blue pearl beads add just enough formality to make this necklace work for any occasion.